We would like to provide a brief summary of all the initiatives and projects carried out by our association ‘International Support – Human Rights‘ from its foundation in 2014 to 2017, thanks to your help and support too. Our activities officially started out in July 2014, when we organised an event in Rome, with Circolo Mario Mieli to raise awareness on Uganda. – In the same year, we started collaborating with the European Parliament’s LGBTI Rights Intergroup and our volunteers in Brussels, where the “LGBTI Kenya Refugee Project in Senegal”, which we still carry on, was born. – After that, we launched a ‘Solidarity Campaign’ for LGBTI people in Kenya and Uganda, with the contribution of Aldo Soligno, a photographer who gave us one of his photos to make our poster. Our association’s logo and poster were created by one of our volunteers. 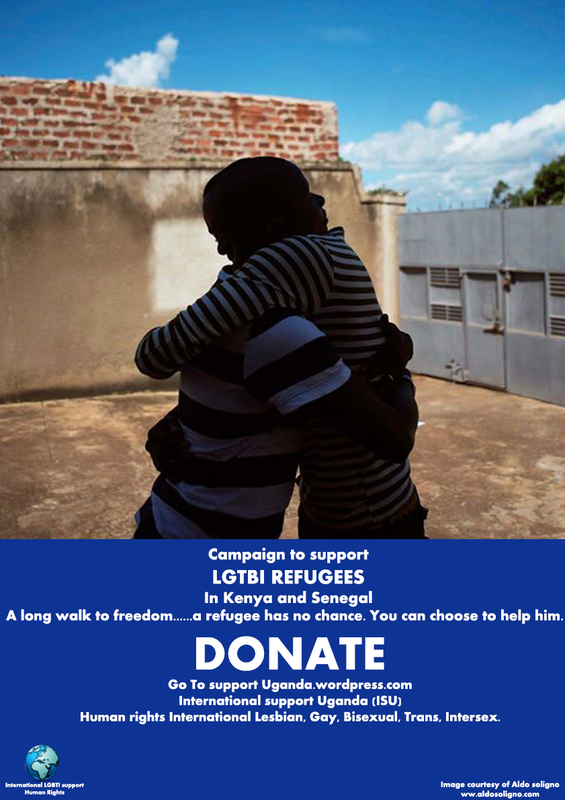 Still in 2014, we helped with the resettlement of LGBTI refugees in Europe, supporting UNHCR’s work in Kenya’s refugee camps. We collaborated with Faruganda Association and the activist Jaquelin Kasha to conduct an interview so as to raise awareness among international governments and the European Parliament on the anti-gay legislation approved by President Museveni in February 2014. From October 2014 up to July 2015, thanks to the contribution of Ilga World and Director Renato Sabbadini we launched a plan for an event in the European Parliament, in collaboration with Ilga Pan Africa and the activist Richard Lusimbo from the office based in Kampala. In January 2015, our association carried out an event to support LGBTI people in Uganda and Nigeria, with the contribution of Brussels Association for LGBTI IGLYO rights, screening the documentary film God Loves Uganda. Afterwards, we designed some Rainbow leaflets with the help of volunteers in order to promote our association ‘International Support – Human Rights’ in the city of Brussels. In February 2015, we conducted a survey on LGBTI people and life conditions in refugees camps in Kenya. Then we spread its results with the help of the associations that support LGBTI refugees in Europe. Our data collection took place in Kakuma Camp in Kenya with the support of LGBTI Refugees and the above-mentioned partner associations. We have been spreading a lot of awareness raising articles on some blogs dealing with international issues such as Frontiers, Crimens76, Planet Queer, Gay Planet, etc. We have created our own blog, website and FB page ‘Support Uganda‘, which deals only with LGBTI community issues in Uganda. We have written various information reports that you can read on our site. Together with our staff we have created our Twitter page too. In October 2015, we organised an event in collaboration with the Cabral Municipal Library, speaker Tobias Pellicciari and anthropologist Luca Jourdan, still on Sexual Discrimination in Africa. The event was a totally free collaboration. Finally, in 2015 and 2016 we thoroughly trained our volunteers and organised LGBTI themed events promoted by the European Parliament and other universities in Brussels. In July 2016, we partnered with MeltingPot for the magazine ‘Africa all’Ordine del Giorno’, to raise public awareness on problems in the African continent and immigration. In December 2016, our volunteers created a charity street market for fundraising. We signed up for ‘Libere Forme Associative’. Still in December 2016, at the Faculty of Law in Bologna, under the patronage of Bologna’s municipality, we organised an event in collaboration with Amnesty International and Pianeta Viola (LGBTI Association in Brescia), dealing with issues of Sexual Discrimination in Uganda. We have been promoting the resettlement of LGBTI people in European countries, especially in Belgium and in Italy. We kept on supporting UNHCR and HIAS and introduced our fundraising project for LGBTI refugees in Kenya. Currently, we are trying to carry out a series of workshops to make the problems of LGBTI migrants known to Italian cooperatives in order to promote the use of better practices to protect the camps from all forms of violence and discrimination. Currently, we keep on working, since we have a lot of ideas in mind for 2017. We are trying to support UNHCR’s work in Kenya camps and we would like to conduct video interviews to make their projects known, as they are still struggling to support LGBTI people in the camps with considerably lacking funds. We are carrying out those workshops in Rome, Bologna, Geneva and Brussels. We are collaborating with VolaBo Association. We are promoting the Change of Transgender Transcript Documents without surgery, thanks to the judgement of the Strasbourg Court delivered on 6 April 2017, using information material and with the active collaboration of Michele Potè, lawyer from Rete Lenford, and our volunteers. The site has been completely renewed and updated. You will find a sample of the material produced by our activists in the attachement. We hope you will keep on supporting us on Social Media, with your contributions, participating in our activities… and why not, even organising and making them happen, so that we can build a Better Future together. Our Association is registered for Associazioni Amiche, the portal promoting our ads and our initiatives. Questo articolo è stato pubblicato in International, Progetti ed etichettato jobs - projects - events.